A speedometer is a powerful device that displays the current speed of the person or a vehicle. It is available for purchase on WalMart, Amazon, Best Buy and other eCommerce portals for within $5 to $500. Frankly speaking, you don’t have to spend money on a speedometer. Here, we’ve shared some cool apps that will convert your phone into a full-fledged speedometer. Modern Android phones support GPS navigation technology. They also allow you to activate high-speed data connection on the mobile device. The speedometer apps we’ve covered here use these two features of your phone and they’re accurate. More importantly, they are free. As the applications use GPS system on your phone to determine the speed of the user or your car/bike, make sure that you enable GPS feature on your phone before running them. 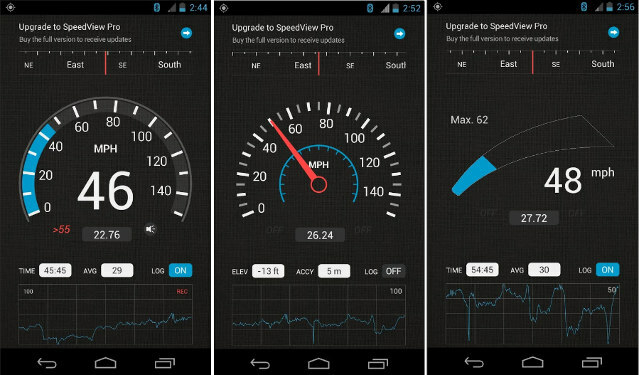 Ulysse is a top-rated speedometer application with plenty of features. The app has an attractive user interface and it is lightweight. Ulysse remains active in the background and displays the speed details on the notification bar. You can easily remove its entry from the notification panel. In case you want to use Ulysse for just a few minutes, you can prevent the app from running in the background by changing its settings. Ulysse supports overlay windows. To see speed metrics on the home screen, users must grant it permission to draw over other apps. The application allows you to change the transparency and size of the overlay interface. Location format, switch to 12 or 24-hour time format. Option to hide or show maximum/minimum speed, set speed limits, play sounds. Users can configure this speedometer app to show weather information. They can adjust the brightness, contrast of the UI. The app supports the night mode feature and HUD mode. It lets users track themselves on Google maps. 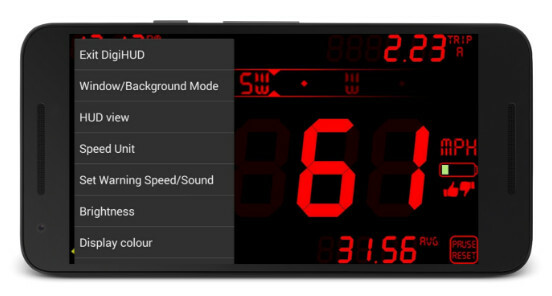 Like Ulysse, the DigiHUD speedometer can function in the background mode. The app enables you to change the color of the text displayed on the screen. The app boasts a statistics interface where you’ll find the distance you’ve traveled. In other words, it functions as an odometer. DigiHUD automatically increases the brightness of the screen to 70% or 80%. To lower the brightness, tap on the display and select the brightness option. DigiHUD lets users set a speed warning/limit. If you don’t want to get caught by the traffic police for over speeding, activate and use this feature. The application enables you to change the default speed unit to MPH or KPH format. DigiHUD is a small application and it has a good interface. It is easy to use and works well on low-end Android devices. 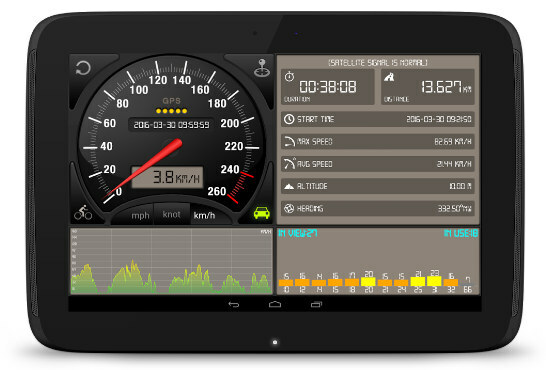 SGPS is one of the most powerful speedometer apps on our list. It requires the following to permission to work. Access photos and media files. Speedometer GPS app supports widely spoken languages which include Hindi, Mandarin, Italian, Portuguese, etc. It has an option to pause or resume the speed tracking function. It allows you to backup or restore the settings. Speedview is a highly accurate app that provides similar features as the Ulysse app. It features a compass module and displays the current direction the user is traveling to. The app allows you to use your phone as a HUD. It generates a special chart which shows the latest traveling speed of the user/vehicle. Like other apps we’ve covered, Speedview lets users set a speed threshold. When the current speed reaches the limit you’ve set, SpeedVew will warn you about it. Speedview supports various units. It allows users to export the recorded tracks to a file. You can save this file to the MicroSD card. The application supports background mode. It is small and powerful. Conclusion: The apps we’ve shared here provide a maximum number of features free of cost. They are accurate and have advertisements which won’t annoy you. Does my android tablet has to have internet on the road? Will the speedometer work if I don’t have everywhere internet? Thanks so much for your time and consideration to my question. Which ones will give you the speed when you are traveling at 5 MPH intervals?